WTW OxiTop® is a series of respirometric measuring systems for the biochemical oxygen demand (BOD) and other aerobic and anaerobic microbiological tests. OxiTop® measuring heads (classic), part of OxiTop® IS packages, are a simple but efficient way of determining BOD5 according to EN 1899-2. OxiTop®-C measuring heads save up to 360 measured values and also measure pressure variation, increase or decrease. 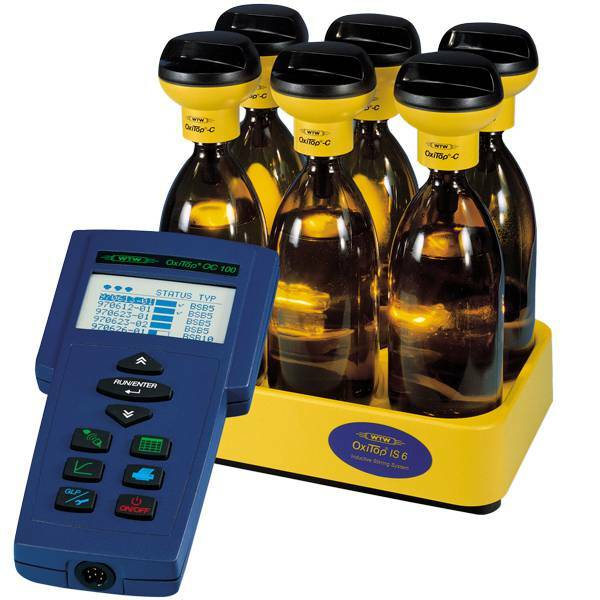 Available in several OxiTop® Control packages with OC100 or OC110 controllers and different vessels they can be used for easy and flexible BOD measurements or many other special applications such as soil respiration (DIN ISO 16072), biodegradability (OECD 301F), and other microbiological activity tests. OxiTop®-C/B measuring heads are a recent inovation, they are included in the OxiTop ® Control AN packages for biogas and anaerobic applications. These systems allow production of methane to be followed and optimised including the ratio against CO2. Special bottles with side nozzles allow the headspace to be flushed with nitrogen at the start, also for samples to be taken throughout the test run, or addition of reagents at any point. Wide range of accessories including stirrers, consumables and incubators complete the packages. These and all other items are sold separately and are available for customisation of the systems which can range from one individual bottle being used up to one hundred being monitored by one controller. Basic, classic OxiTop® heads for BOD5 routine measurements according to EN 1899-2. Automatically and safely stores 1 measurement per day for 5 days, optional manual measurements at any time. No need for multiple closed bottles per data point. Measuring range up to 4.000 mg/L BOD without the need to dilute samples. Complete packages for 6 or 12 samples ready for use including all items and accessories needed. Overflow flasks allow for accurate measurement of sample volume and easy calculations to obtain BOD final value. 432mL is supplied as standard with the packages and can be used for 0-40mg/L BOD range. In those conditions, readings from the OxiTop® head will represent directly the BOD value in mg/L. Other volumes are available down to 22,7mL and by applying a multiplication factor the readings can give you measurements up to 100 times higher. The BOD measurement with OxiTop® is based on pressure measurement in a closed system. The microorganisms in the sample consume oxygen, O2, and generate carbon dioxide, CO2, in the process. The CO2 gas produced is absorbed by NaOH, typically in pellets, that way the decrease in pressure (vacuum) will directly correlate to the consumption of O2 and thus BOD, given in mg/L. By decreasing the sample volume for higher expected BOD samples we guarantee more O2 in the headspace avoiding depletion and allowing up to 4,000 mg/L BOD to be measured. OxiTop® IS 6 / 12 / 6-12 include OxiTop® heads half in green and half in yellow. The colours are traditionally used to differentiate between inlet and outlet samples and are otherwise the same. AutoTemp function is in-built to allow temperature stabilization before measurement starts. It creates a lag of 1h since the head is started and the first measurement and if the sample temperature is still too cold, below 20ºC, it can delay up to 2h more. OxiTop®-C heads and OxiTop® Control systems are our next generation of respirometers which can do not only routine BOD, but also other applications due to additional features. The heads automatically and safely store up to 360 measurements for up to 99 days. The controllers OC100 and OC110 are the infrared interfaces for collecting and managing data. The software-controlled functions will start, manage, save and track up to 100 measuring heads at the same time. The large display facilitates graphical representation of the results from which time-saving and error-free automatic statistical evaluations can be generated. Operation is overall streamlined with samples IDs, with set up of multiple processes or different individual ones and data transfer to a PC for GLP processing (with cable AK-540/B and communications program Achat OC – available online). OxiTop® Control 6 / 12 are the right choice for BOD5 with GLP requirements or longer tests and/or more data points are desirable. OxiTop® Control IS 6 / 12 allow you to add more systems to the initial purchase, as these don't include the controller. OxiTop® Control A 6 / A 12 or S 6 / S 12 are the right choice for further flexibility and special applications. One of the important uses is in biodegradability studies according to DIN ISO 29 408 / ISO 9408 / OECD 301 F standards. This is a very important test as it can ensure environmental protection and minimal disposal costs for "new" chemicals being introduced in the market for the first time. Typically this the test compound or mixture is tested for 28 days and CO2 trap is used in the same way as a normal BOD. Advantages of these systems over more basic ones are the extended test time and continuous monitoring offered by the C heads and the possibility of customising volumes and temperatures and GLP documentation offered by controller OC 110. 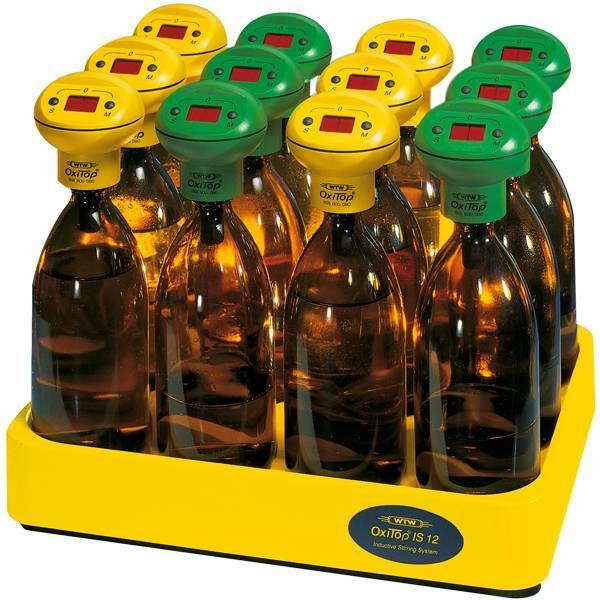 Furthermore, the bottles and adapters can be autoclaved at 121ºC. OxiTop® Control B 6 / B 6M / B 6M-2.5 systems are designed to determine the microbial soil respiration according to DIN ISO 16072 or AT4 directive. Soil testing does not require stirring, but often requires adapted bottles for different CO2 trap systems, so these packages have been adapted to those requirements. The special vessels were tested and provide great precision combined with ease of use at a reasonable cost. The soil respiration measurement is used for the prognosis, inventory and control of remediation tasks, for biochemical degradation measurements of substances (pesticides, fungicides, fertilizer...) as well as to conduct toxicity tests. For soils with higher CO2 development, the measuring vessel MG 1.0, with 1L and part of B 6M package, is recommended. It has a larger opening (approx. 100 mm diameter) for use of large volume absorber vessels for the subsequent quantitative CO2 determination. To measure the soil respiration according to the AT4 directive, there is another especially designed package, B 6M-2.5, that contains measuring vessel with a capacity of 2.5L as well as a special CO2 absorber with indicator. OxiTop®-C/B heads are now part of the OxiTop® Control AN systems which have been developed particularly for biogas measurements and anaerobic microbiology studies. The C/B heads provide corrosion resistance against small quantities of hydrogen sulphide (H2S) which develops with methane (CH4) and CO2 in biogas applications. Increase in pressure will directly correlate with gas development. The special bottles with side nozzles and septa facilitate flushing of the headspace with nitrogen to ensure anaerobic conditions at the start of the test. They allow targeted manipulations like addition of substrates and reagents, e.g. injection of CO2 expulsion and absorbing solutions at the end point providing the ratio between the 2 main gases and determination of the specific CH4 yield. Furthermore, sampling of the headspace or even the sample is possible throughout the testing period. As the anaerobic processes lead to a pressure increase, the measuring range limits may be exceeded. For such cases, it is possible to indicate a "warning pressure" or pressure limit value, so that the user can manipulate the system and avoid any hazards.